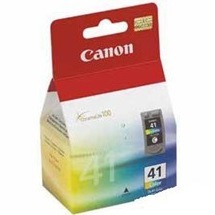 Genuine OEM Canon Ink Cartridge, Color, 300 page yield. Single cartridge contains Cyan, Magenta, and Yellow ink. Canon part number: CL-41, 0617B002, CL-41 Color.